Elyx, the UN digital ambassador, arrived in Democratic Republic of the Congo (DRC) and immediately joined members of the UN for a tour of the country. Despite a vast amount of natural and mineral resources, DRC ranked 186th out of 187 countries on the Human Development Index. Ongoing conflict and general insecurity have led to one of the largest and most complex humanitarian crises of recent years. Today DRC has more than 2.8 million internally displaced people and approximately 120,000 refugees from neighbouring countries live within its borders, more than 6.5 million are food insecure and nearly 1 million children suffer from acute malnutrition. Last week the United Nations Assistant Secretary-General for Humanitarian Affairs, Kyung-wha Kang, spent four days in DRC. She called on the international community to ensure that one of the longest crises in the world does not “fall off the humanitarian radar”. UN agencies have been active in the DRC for the past decades to help alleviate the humanitarian and security crisis and since 1999, the UN peacekeeping mission MONUSCO (previously MONUC) has been operating in DRC to protect civilians and consolidate peace. Elyx will meet with the Blue Helmets tomorrow. First Elyx went to the Equateur province to visit an FAO and WFP joint project called P4P (Purchase for Progress), which aims to increase agricultural production and to improve access to markets for small farmers. P4P supports farmers to increase the quality and quantity of their production and to become more competitive. 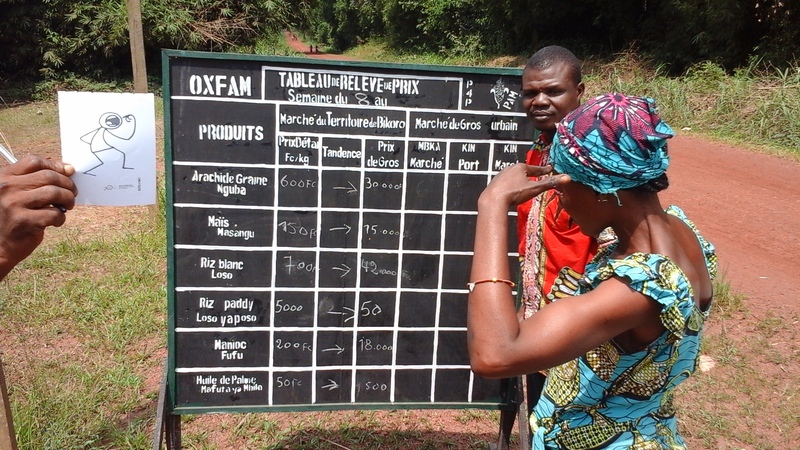 Elyx takes a look at the Market Information System in Kalamba Union, Bikoro territories (Photo: WFP/Olivier Le Blanc). As the majority of smallholder farmers are women, P4P also stimulates gender equality. P4P has enabled women to become more active and engaged in their local communities and today several farmer organizations are led by women. The P4P project also organises training in literacy. 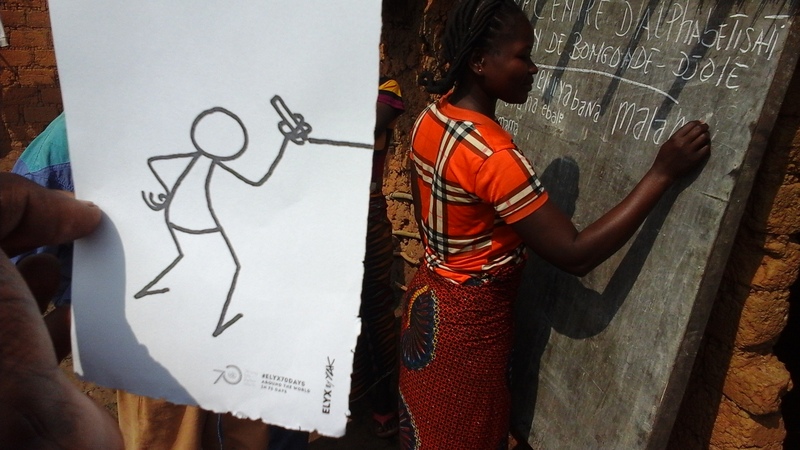 Elyx stopped to attend a literacy class while passing through Buya, in the Bikoro territories. Afterwards Elyx hopped into a chopper operated by UNHAS, the United Nations Humanitarian Air Service, which transports UN and NGO’s staff and material. Insecurity, lack of reliable air companies and poor infrastructure make it very difficult for the UN to reach vulnerable communities by road. While DRC is 76 times bigger than Belgium, it has only 2,250 km of paved roads, compared to 120,000 km in Belgium. This makes the assistance of UNHAS essential to the success of UN operations in DRC. 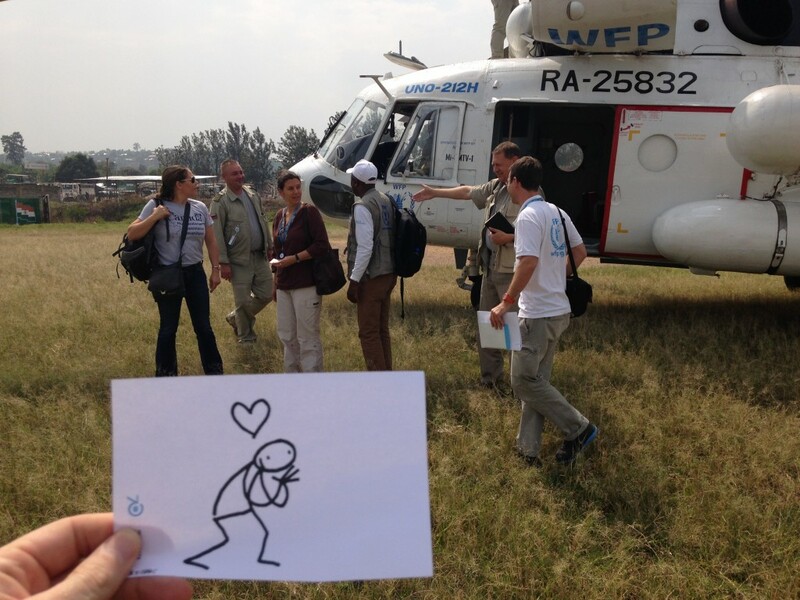 Elyx lands in South Kivu (Photo: WFP/Olivier Le Blanc). The UNHAS helicopter landed in Bukavu, in eastern DRC, and the UN digital ambassador began to explore the conflict stricken areas in the Great Lakes region. Elyx joined the UN refugee agency (UNHCR) team. UNHCR supports and protects internally displaced people and refugees from neighbouring countries. 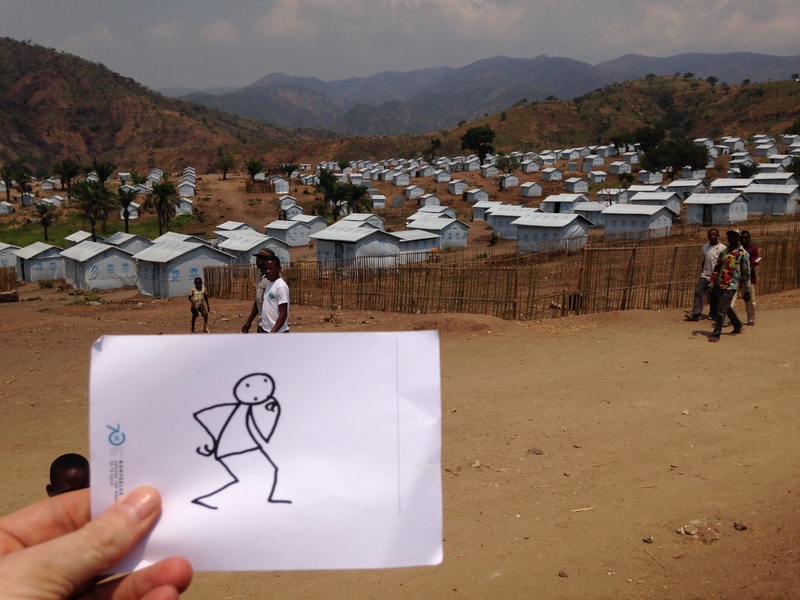 Elyx paid a visit to the 7,000 Burundi refugees sheltered at the Lusenda camp. It worried Elyx to hear that this camp was nearly full and would not be able to take in many more refugees, but the WFP assured the digital ambassador that refugees are also taken in by local host families. In South Kivu 94% of all displaced people find refuge with host families. 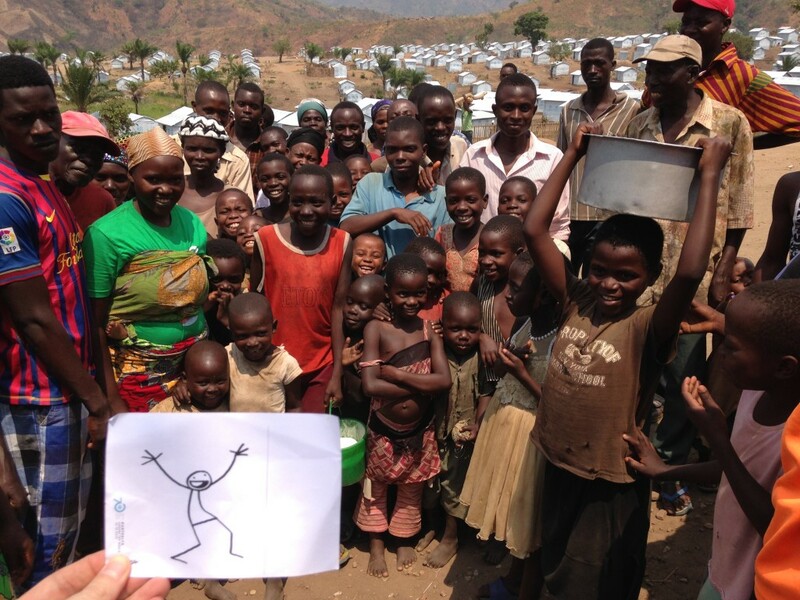 Elyx meets Burundi refugees in the Lusenda refugee camp (Photo: WFP/Olivier Le Blanc). Elyx went back to the chopper and with a heavy heart, the digital ambassador cast one last look at South Kivu. The situation in the Great Lakes region has given Elyx much to think about.